Working harder isnt always enough when you need to outperform your competition or meet tight deadlines. Thats why the RICOH Aficio MP C2050 is so groundbreaking. This incredibly versatile system makes it affordable to add attention-grabbing color. Plus with the optional internal finisher, you can create finished documents without sacrificing floor space. 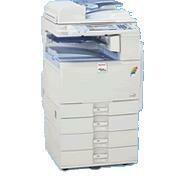 No matter what document tasks you handle, the Ricoh Aficio MP C2050 is the smart choice. Maintain high productivity for every job. Deliver up to 20 pages-per-minute for full-color and black & white documents, from daily correspondence and Web pages to financial reports, customer presentations and proposals. Reduce costs and enhance your company's image. This four-in-one MFP offers color output that is less expensive than inkjet"so you can cost-effectively create professional documents that impress your most important customers. Keep outsourcing costs down"and confidential documents in-house. With your own color device, you get the color you want without relying on expensive outside vendors. Save space with a compact design that lets you choose the configuration that is right for you. You can even add finishing capabilities"with a minimal increase to the systems original footprint. (RPCS) driver, as well as PCL5c/6, XPS and optional genuine Adobe PostScript drivers.